The recent demonstration of dissipative Kerr solitons in microresonators has opened a new pathway for the generation of ultrashort pulses and low-noise frequency combs with gigahertz to terahertz repetition rates, enabling applications in frequency metrology, astronomy, optical coherent communications, and laser-based ranging. A main challenge for soliton generation, in particular in ultra-high-Q resonators, is the sudden change in circulating intracavity power during the onset of soliton generation. This sudden power change requires precise control of the seed laser frequency and power or fast control of the resonator temperature. Here, we report a robust and simple way to increase the soliton access window by using an auxiliary laser that passively stabilizes intracavity power. In our experiments with fused silica resonators, we are able to extend the access range of microresonator solitons by two orders of magnitude, which enables soliton generation by slow and manual tuning of the pump laser into resonance and at unprecedented low power levels. Importantly, this scheme eliminates the sudden change in circulating power (“soliton step”) during transition into the soliton regime. Both single- and multi-soliton mode-locked states are generated in a 1.3-mm-diameter fused silica microrod resonator with a free spectral range of ∼50.6 GHz, at a 1554 nm pump wavelength at threshold powers <3 mW. Moreover, with a smaller 230-μm-diameter microrod, we demonstrate soliton generation at 780 μW threshold power. The passive enhancement of the soliton access range paves the way for robust and low-threshold microcomb systems and has the potential to be a practical tool for soliton microcomb generation. T. Rosenband, D. B. Hume, P. O. Schmidt, C. W. Chou, A. Brusch, L. Lorini, W. H. Oskay, R. E. Drullinger, T. M. Fortier, J. E. Stalnaker, S. A. Diddams, W. C. Swann, N. R. Newbury, W. M. Itano, D. J. Wineland, and J. C. Bergquist, “Frequency ratio of Al+ and Hg+ single-ion optical clocks; metrology at the 17th decimal place,” Science 319, 1808–1812 (2008). C. W. Chou, D. B. Hume, J. C. Koelemeij, D. J. Wineland, and T. Rosenband, “Frequency comparison of two high-accuracy Al+ optical clocks,” Phys. Rev. Lett. 104, 070802 (2010). S. A. Diddams, T. Udem, J. C. Bergquist, E. A. Curtis, R. E. Drullinger, L. Hollberg, W. M. Itano, W. D. Lee, C. W. Oates, K. R. Vogel, and D. J. Wineland, “An optical clock based on a single trapped 199Hg+ ion,” Science 293, 825–828 (2001). N. R. Newbury, “Searching for applications with a fine-tooth comb,” Nat. Photonics 5, 186–188 (2011). T. M. Fortier, M. S. Kirchner, F. Quinlan, J. Taylor, J. C. Bergquist, T. Rosenband, N. Lemke, A. Ludlow, Y. Jiang, C. W. Oates, and S. A. Diddams, “Generation of ultrastable microwaves via optical frequency division,” Nat. 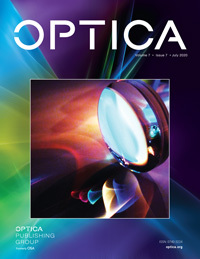 Photonics 5, 425–429 (2011). X. Xie, R. Bouchand, D. Nicolodi, M. Giunta, W. Hänsel, M. Lezius, A. Joshi, S. Datta, C. Alexandre, and M. Lours, “Photonic microwave signals with zeptosecond-level absolute timing noise,” Nat. Photonics 11, 44–47 (2017). J. Kim, M. J. Park, M. H. Perrott, and F. X. Kärtner, “Photonic subsampling analog-to-digital conversion of microwave signals at 40-GHz with higher than 7-ENOB resolution,” Opt. Express 16, 16509–16515 (2008). P. Ghelfi, F. Laghezza, F. Scotti, G. Serafino, A. Capria, S. Pinna, D. Onori, C. Porzi, M. Scaffardi, and A. Malacarne, “A fully photonics-based coherent radar system,” Nature 507, 341–345 (2014). G. B. Rieker, F. R. Giorgetta, W. C. Swann, J. Kofler, A. M. Zolot, L. C. Sinclair, E. Baumann, C. Cromer, G. Petron, and C. Sweeney, “Frequency-comb-based remote sensing of greenhouse gases over kilometer air paths,” Optica 1, 290–298 (2014). P. Del’Haye, A. Schliesser, O. Arcizet, T. Wilken, R. Holzwarth, and T. J. Kippenberg, “Optical frequency comb generation from a monolithic microresonator,” Nature 450, 1214–1217 (2007). T. J. Kippenberg, R. Holzwarth, and S. A. Diddams, “Microresonator-based optical frequency combs,” Science 332, 555–559 (2011). T. J. Kippenberg, A. L. Gaeta, M. Lipson, and M. L. Gorodetsky, “Dissipative Kerr solitons in optical microresonators,” Science 361, eaan8083 (2018). J. Li, H. Lee, T. Chen, and K. J. Vahala, “Low-pump-power, low-phase-noise, and microwave to millimeter-wave repetition rate operation in microcombs,” Phys. Rev. Lett. 109, 233901 (2012). T. Herr, V. Brasch, J. D. Jost, C. Y. Wang, N. M. Kondratiev, M. L. Gorodetsky, and T. J. Kippenberg, “Temporal solitons in optical microresonators,” Nat. Photonics 8, 145–152 (2014). W. Liang, D. Eliyahu, V. S. Ilchenko, A. A. Savchenkov, A. B. Matsko, D. Seidel, and L. Maleki, “High spectral purity Kerr frequency comb radio frequency photonic oscillator,” Nat. Commun. 6, 7957 (2015). M. A. Foster, J. S. Levy, O. Kuzucu, K. Saha, M. Lipson, and A. L. Gaeta, “Silicon-based monolithic optical frequency comb source,” Opt. Express 19, 14233–14239 (2011). S.-W. Huang, J. Yang, J. Lim, H. Zhou, M. Yu, D.-L. Kwong, and C. Wong, “A low-phase-noise 18 GHz Kerr frequency microcomb phase-locked over 65 THz,” Sci. Rep. 5, 13355 (2015). V. Brasch, M. Geiselmann, T. Herr, G. Lihachev, M. H. Pfeiffer, M. L. Gorodetsky, and T. J. Kippenberg, “Photonic chip-based optical frequency comb using soliton Cherenkov radiation,” Science 351, 357–360 (2016). P.-H. Wang, J. A. Jaramillo-Villegas, Y. Xuan, X. Xue, C. Bao, D. E. Leaird, M. Qi, and A. M. Weiner, “Intracavity characterization of micro-comb generation in the single-soliton regime,” Opt. Express 24, 10890–10897 (2016). H. Guo, M. Karpov, E. Lucas, A. Kordts, M. H. Pfeiffer, V. Brasch, G. Lihachev, V. E. Lobanov, M. L. Gorodetsky, and T. J. Kippenberg, “Universal dynamics and deterministic switching of dissipative Kerr solitons in optical microresonators,” Nat. Phys. 13, 94–102 (2017). Q. Li, T. C. Briles, D. A. Westly, T. E. Drake, J. R. Stone, B. R. Ilic, S. A. Diddams, S. B. Papp, and K. Srinivasan, “Stably accessing octave-spanning microresonator frequency combs in the soliton regime,” Optica 4, 193–203 (2017). A. G. Griffith, R. K. Lau, J. Cardenas, Y. Okawachi, A. Mohanty, R. Fain, Y. H. D. Lee, M. Yu, C. T. Phare, and C. B. Poitras, “Silicon-chip mid-infrared frequency comb generation,” Nat. Commun. 6, 6299 (2015). B. Hausmann, I. Bulu, V. Venkataraman, P. Deotare, and M. Lončar, “Diamond nonlinear photonics,” Nat. Photonics 8, 369–374 (2014). M. Peccianti, A. Pasquazi, Y. Park, B. Little, S. T. Chu, D. Moss, and R. Morandotti, “Demonstration of a stable ultrafast laser based on a nonlinear microcavity,” Nat. Commun. 3, 765 (2012). M. H. Pfeiffer, C. Herkommer, J. Liu, H. Guo, M. Karpov, E. Lucas, M. Zervas, and T. J. Kippenberg, “Octave-spanning dissipative Kerr soliton frequency combs in Si3N4 microresonators,” Optica 4, 684–691 (2017). X. Yi, Q.-F. Yang, K. Y. Yang, M.-G. Suh, and K. Vahala, “Soliton frequency comb at microwave rates in a high-Q silica microresonator,” Optica 2, 1078–1085 (2015). E. Obrzud, S. Lecomte, and T. Herr, “Temporal solitons in microresonators driven by optical pulses,” Nat. Photonics 11, 600–607 (2017). M. Yu, Y. Okawachi, A. G. Griffith, M. Lipson, and A. L. Gaeta, “Mode-locked mid-infrared frequency combs in a silicon microresonator,” Optica 3, 854–860 (2016). M.-G. Suh and K. Vahala, “Gigahertz-repetition-rate soliton microcombs,” Optica 5, 65–66 (2018). S. H. Lee, D. Y. Oh, Q.-F. Yang, B. Shen, H. Wang, K. Y. Yang, Y.-H. Lai, X. Yi, X. Li, and K. Vahala, “Towards visible soliton microcomb generation,” Nat. Commun. 8, 1295 (2017). D. T. Spencer, T. Drake, T. C. Briles, J. Stone, L. C. Sinclair, C. Fredrick, Q. Li, D. Westly, B. R. Ilic, and A. Bluestone, “An optical-frequency synthesizer using integrated photonics,” Nature 557, 81–85 (2018). E. Obrzud, M. Rainer, A. Harutyunyan, M. Anderson, M. Geiselmann, B. Chazelas, S. Kundermann, S. Lecomte, M. Cecconi, and A. Ghedina, “A microphotonic astrocomb,” arXiv:1712.09526 (2017). M.-G. Suh, X. Yi, Y.-H. Lai, S. Leifer, I. S. Grudinin, G. Vasisht, E. C. Martin, M. P. Fitzgerald, G. Doppmann, and J. Wang, “Searching for exoplanets using a microresonator astrocomb,” arXiv:1801.05174 (2018). J. Pfeifle, V. Brasch, M. Lauermann, Y. Yu, D. Wegner, T. Herr, K. Hartinger, P. Schindler, J. Li, and D. Hillerkuss, “Coherent terabit communications with microresonator Kerr frequency combs,” Nat. Photonics 8, 375–380 (2014). M.-G. Suh and K. J. Vahala, “Soliton microcomb range measurement,” Science 359, 884–887 (2018). P. Trocha, M. Karpov, D. Ganin, M. H. Pfeiffer, A. Kordts, S. Wolf, J. Krockenberger, P. Marin-Palomo, C. Weimann, and S. Randel, “Ultrafast optical ranging using microresonator soliton frequency combs,” Science 359, 887–891 (2018). M.-G. Suh, Q.-F. Yang, K. Y. Yang, X. Yi, and K. J. Vahala, “Microresonator soliton dual-comb spectroscopy,” Science 354, 600–603 (2016). A. Dutt, C. Joshi, X. Ji, J. Cardenas, Y. Okawachi, K. Luke, A. L. Gaeta, and M. Lipson, “On-chip dual-comb source for spectroscopy,” Sci. Adv. 4, e1701858 (2018). M. Yu, Y. Okawachi, A. G. Griffith, N. Picqué, M. Lipson, and A. L. Gaeta, “Silicon-chip-based mid-infrared dual-comb spectroscopy,” Nat. Commun. 9, 1869 (2018). D. C. Cole, E. S. Lamb, P. Del’Haye, S. A. Diddams, and S. B. Papp, “Soliton crystals in Kerr resonators,” Nat. Photonics 11, 671–676 (2017). Q.-F. Yang, X. Yi, K. Y. Yang, and K. Vahala, “Stokes solitons in optical microcavities,” Nat. Phys. 13, 53–57 (2017). T. Carmon, L. Yang, and K. J. Vahala, “Dynamical thermal behavior and thermal self-stability of microcavities,” Opt. Express 12, 4742–4750 (2004). Z. Kang, F. Li, J. Yuan, K. Nakkeeran, J. N. Kutz, Q. Wu, C. Yu, and P. Wai, “Deterministic generation of single soliton Kerr frequency comb in microresonators by a single shot pulsed trigger,” Opt. Express 26, 18563–18577 (2018). X. Sun, R. Luo, X. C. Zhang, and Q. Lin, “Squeezing the fundamental temperature fluctuations of a high-Q microresonator,” Phys. Rev. A 95, 023822 (2017). V. Brasch, M. Geiselmann, M. H. Pfeiffer, and T. J. Kippenberg, “Bringing short-lived dissipative Kerr soliton states in microresonators into a steady state,” Opt. Express 24, 29312–29320 (2016). X. Yi, Q.-F. Yang, K. Y. Yang, and K. Vahala, “Active capture and stabilization of temporal solitons in microresonators,” Opt. Lett. 41, 2037–2040 (2016). J. R. Stone, T. C. Briles, T. E. Drake, D. T. Spencer, D. R. Carlson, S. A. Diddams, and S. B. Papp, “Thermal and nonlinear dissipative-soliton dynamics in Kerr-microresonator frequency combs,” Phys. Rev. Lett. 121, 063902 (2018). N. Volet, X. Yi, Q. F. Yang, E. J. Stanton, P. A. Morton, K. Y. Yang, K. J. Vahala, and J. E. Bowers, “Micro-resonator soliton generated directly with a diode laser,” Laser Photon. Rev. 12, 1700307 (2018). C. Joshi, J. K. Jang, K. Luke, X. Ji, S. A. Miller, A. Klenner, Y. Okawachi, M. Lipson, and A. L. Gaeta, “Thermally controlled comb generation and soliton modelocking in microresonators,” Opt. Lett. 41, 2565–2568 (2016). Y. Geng, M. Liao, H. Zhou, B. Wu, and K. Qiu, “Kerr frequency comb dynamics circumventing cavity thermal behavior,” in Nonlinear Optics (Optical Society of America, 2017), paper NM1A. 4. Y. Geng, X. Huang, W. Cui, Y. Ling, B. Xu, J. Zhang, X. Yi, B. Wu, S.-W. Huang, and K. Qiu, “Terabit optical OFDM superchannel transmission via coherent carriers of a hybrid chip-scale soliton frequency comb,” Opt. Lett. 43, 2406–2409 (2018). C. Bao, Y. Xuan, D. E. Leaird, S. Wabnitz, M. Qi, and A. M. Weiner, “Spatial mode-interaction induced single soliton generation in microresonators,” Optica 4, 1011–1015 (2017). B. Stern, X. Ji, Y. Okawachi, A. L. Gaeta, and M. Lipson, “Battery-operated integrated frequency comb generator,” Nature 562, 401–405 (2018). P. Del’Haye, S. A. Diddams, and S. B. Papp, “Laser-machined ultra-high-Q microrod resonators for nonlinear optics,” Appl. Phys. Lett. 102, 221119 (2013). J. Jost, E. Lucas, T. Herr, C. Lecaplain, V. Brasch, M. Pfeiffer, and T. Kippenberg, “All-optical stabilization of a soliton frequency comb in a crystalline microresonator,” Opt. Lett. 40, 4723–4726 (2015). Z. Lu, W. Wang, W. Zhang, S. T. Chu, B. E. Little, M. Liu, L. Wang, C.-L. Zou, C.-H. Dong, and B. Zhao, “Deterministic generation and switching of dissipative Kerr soliton in a thermally controlled micro-resonator,” arXiv:1810.04983 (2018). R. Niu, S. Wan, S.-M. Sun, T.-G. Ma, H.-J. Chen, W.-Q. Wang, Z.-Z. Lu, W.-F. Zhang, G.-C. Guo, and C.-L. Zou, “Repetition rate tuning of soliton in microrod resonators,” arXiv:1809.06490 (2018). » Visualization 1 Passive stabilization microresonator modes using an auxiliary laser. Animated version of Figure 1 in the paper “µW-Level Microresonator Solitons with Extended Stability Range Using an Auxiliary Laser”. Fig. 1. (a) Scheme of using an auxiliary laser to assist in accessing soliton states. The 1.5 μm pump laser generates a microresonator soliton while the second laser at 1.3 μm wavelength passively stabilizes the intracavity power. (b) Illustration of the intracavity power (red: 1.5 μm, green: 1.3 μm) before (left panel) and after (right panel) soliton generation. (c) Microscope image of the 1.3-mm-diameter fused silica microrod resonator used in the experiments. Panels (d)–(f) show the principle of the passive compensation of the circulating power in the microresonator by the auxiliary laser in order to enhance the soliton range (animated version available in Visualization 1). In panel (d), only the auxiliary laser is coupled into a resonator mode. When tuning the pump laser into resonance, shown in panel (e), the thermal shift of the resonator modes automatically reduces the amount of light coupled into the auxiliary resonator mode. Panel (f) shows the abrupt transition into a soliton state, which reduces the coupled power of the pump laser. In this state, the pump resonance splits into C-resonance (resonance for light arriving out-of-sync with the soliton) and S-resonance (resonance for light arriving in-sync with the soliton). The reduction in pump power in the soliton regime moves the auxiliary resonance back towards the auxiliary laser and thus compensates the power loss. Panel (g) shows the temporal evolution of the intracavity power when tuning the pump laser into resonance with a fixed frequency auxiliary laser. Panel (h) shows a measurement according to the scheme in panel (g). The two steps in soliton regime correspond to different soliton numbers circulating in the cavity. The 1.3 μm auxiliary laser passively compensates changes in circulating power of the pump laser. Fig. 2. (a) Experimental setup for the generation of a soliton mode-locked frequency comb in a silica microrod resonator by using an auxiliary laser to compensate the resonator’s thermal shift. ECDL, external cavity diode laser; WDM, wavelength division multiplexer; PC, polarization controller; FBG, fiber Bragg grating; PD, photodetector; OSC, oscilloscope; OSA, optical spectrum analyzer; ESA, electronic spectrum analyzer. (b) Optical spectrum of a single-soliton state pumped with 80 mW optical power compensated by 60 mW auxiliary laser power. The red dashed line shows the fitted sech2 envelope. Inset: spectrum of the microwave repetition rate frep of the single-soliton state measured with a 1 kHz resolution bandwidth (RBW). (c) Optical spectrum of a two-soliton state pumped with the same settings of pump and auxiliary laser as Fig. 2(b). (d) Optical spectrum of a single-soliton state pumped at 3 mW power with a fitted sech2 envelope. (e) Optical spectrum of a single-soliton state in a 230-μm-diameter microrod pumped with 780 μW power. Fig. 3. Enhancement of the soliton access range. (a) Experimental traces of the 1550 nm intracavity power when scanning the pump laser frequency from blue to red detuning without auxiliary laser (upper panel) and with auxiliary laser (lower panel). The laser tuning speed is ∼35 MHz/ms. The inset in the upper panel shows a trace of the narrow soliton step with a width of ∼100 kHz without auxiliary laser. The lower panel shows the same resonance while 50 mW auxiliary power is coupled into the resonator. The thermally broadened width of the resonance is reduced, while the soliton access range is increased by two orders of magnitude to ∼10 MHz. The presence of the auxiliary laser eliminates the sudden power change (“soliton step”) during the transition into the soliton regime. (b) Traces of the 1550 nm intracavity power for different multi-soliton states (with auxiliary laser). Fig. 4. Tuning behavior of the doubly pumped resonator system. (a) (b) Experimental and numerically calculated traces of the shape of the thermally broadened resonances at 1550 nm at different fixed detunings of the 1330 nm laser from the auxiliary resonance. The 1550 nm pump laser is tuned at ∼35 MHz/ms during the measurement. (c) Experimental measurement (squares) of the width of 1550 nm resonances as a function of the detuning of the 1330 nm auxiliary laser from its resonance. The red line is a simulation based on the thermal dynamic behavior of a doubly pumped microresonator. (d) Experimental measurement and linear fit of the relative resonance shift of the 1550 nm and 1330 nm modes with a slope of 0.862.